Remains found near the area of Agios Alexios (“Saint Alexis”) in Alonitsi, prove that the island had developed prehistoric settlement during the third millennium BC. According to the tradition, Saint Efstratios formerly was called Nea ("New") because it was the new island that appeared after the sinking of the island of Chrisi (“Golden”) near Lemnos. In the beginning of the 5th century BC, the island was inhabited as well as hellenized by the Athenians, whereas during the Roman period, due to the fact that many battles occurred in the region, several islands suffered from desolation until the second century AD. In the Byzantine years, the island suffered many attacks by pirates and as a result when Agios Efstratios arrived at the island in 813 AD, he found only 2 people. Later on, the island was annexed to the monastery of Megistis Lavras (“Great Lavra”) on Mount Athos and experienced great economic and population boom. At this time, the village of Agios Minas was built by the inhabitants. In the 14th century Agios Efstratios passed into the hands of the Genoese. However, the raids of the pirates continued and as a result the island was deserted until the beginning of the 16th century. In 1540, after a cease-fire agreement between the Venetians and the Ottomans, the island fell into hands of the last ones. During the 17th and 18th century, a significant economic development occurred on the island, which leads the inhabitants to work as farmers and fishrmen. During the Greek revolution of 1821, there was an important involvement of individual seafarers to ships' crews from nearby islands. 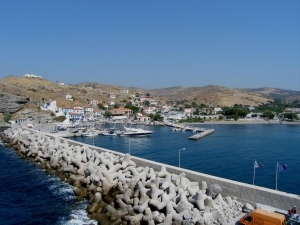 Eventually, Agios Efstratios was officially recognized as a greek island by the Great Powers in 1914 . Between 1928 and 1963 the island had been used as a place of political exile. During the civil war, the exiles reached 6,000 and stayed in tents as well as in buildings made of plinths. Many Modern Greek intellectuals of great importance had lived as political prisoners on the island ofAgios Efstratios like Ioannis (“John”) Ritsos, Manos Katrakis, Tassos Livaditis, Kostas Varnalis, Mikis Theodorakis, Nikos Karouzos and Konstantinos (“Constantine”) Varnalis. Today’s village is quit new since it has been rebuilt after the devastating earthquake of 1968. The residents left their homes and were sheltered in the new settlement, which is built in the area where previously their farms were.